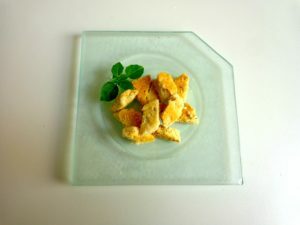 This savory shortbread can be used as a garnish for soup or served as a palate pleaser at cocktail hour. The biscuits are tiny and rather rich. Place the butter in a shallow bowl. Add the flour and salt. Mash together with a fork, then go in with your hands to blend well. Add the dried herbs and mix in. Form the dough into a ball and allow to rest for a few minutes. Then roll it out on a floured board — it should be nor more than 1/8 inch (3 cm) thick. Aim for a rectangular shape. Transfer the dough to a baking sheet. Using a kitchen knife, score it lightly into small squares. Do not cut all the way through the dough. Bake for 20-30 minutes, until the edges are starting to brown. As soon as your pan comes out of the oven, slice through the squares along the scoring lines. Allow to cool thoroughly. Makes about 20 tiny biscuits.